Bishop Daniel Flores places the miter on the head of Bishop Mario Alberto Avilés, the first auxiliary bishop of the Diocese of Brownsville, during an ordination at the Basilica of Our Lady of San Juan del Valle National Shrine on Thursday, February 22, 2018 in San Juan. 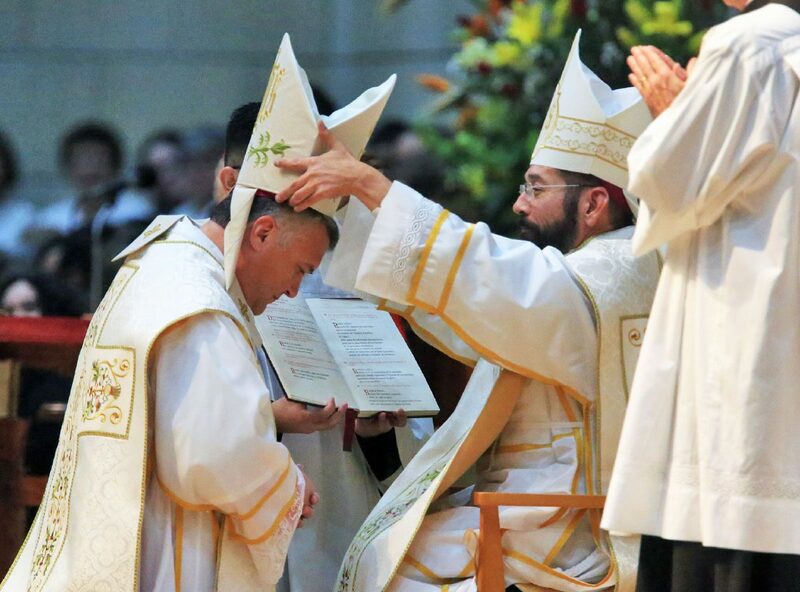 SAN JUAN — A momentous first-time event was celebrated Thursday at the Basilica of The National Shrine of Our Lady of San Juan del Valle as the first auxiliary bishop of the local diocese was ordained. In a two-and-a-half-hour ceremonial Mass, the Most Rev. Mario Alberto Avilés completed the rites to become a bishop in the Catholic church. The 48-year-old, originally from Mexico City, moved to the Rio Grande Valley at the age 17 and began his studies for the priesthood shortly thereafter. In July, he will complete 20 years as a priest in the Valley. Bishops from across Texas and Mexico were in attendance to witness the first ordination of a bishop in the Rio Grande Valley. Bishop Daniel E. Flores welcomed his fellow bishops and the more than 50 local priests and large crowd that packed the basilica. “We ask the lord to bare our hearts and to celebrate this great history of his grace to receive this new Bishop and by his ordination of the success from the Apostles,” Flores said. A concelebrant bishop, the Most Reverend Christophe Pierre, the pope’s representative in the United States, read Pope Francis’ letter, which was translated from Latin, naming Avilés as a bishop for the Diocese of Brownsville. After the letter was read, Avilés was led by other priests assisting him to the principal ordaining bishop and co-consecrators to witness the document. Avilés also made his way around the shrine with the letter for public view. Deacon Luis Zuniga, who works for the diocese as a leadership trainer to encourage members to become active in their parish, said the Catholic church is growing. He explained that there are various duties for bishops. Avilés received a ring during the ceremony symbolizing the bishop’s fidelity, the miter to signify his resolve to pursue holiness, and the crozier signifying of the duty of guiding and governing the church entrusted to him. Following the ordination rites, the new auxiliary bishop closed the ceremony by giving his thanks to the Holy Father, his family and the Valley. “Keeping praying for me to continue being faithful and at service to all of you and the church of God.” Avilés said.